As a new parent, waking to feed or change diapers for your baby at the wee hours of the night will be a routine. The hardest part comes when trying to get your b﻿aby back to sleep so that you can as well have a few hours of sleep before going to work. Your efforts might sometimes turn very unfruitful, and you will remain watching your baby till it dawns. With the best nursery glider at home, you will kiss the long hours of trying to keep your little one a sleep goodbye. A glider will be a great companion that will serve you and your little one. A glider will ease your stress levels as well. This glider is made to provide convenience and superior functionality. It is beautiful and will match with your living room furniture. You will not have to isolate it from the rest. You will lull your little one to sleep without a struggle in this traditional masterpiece. This glider and the ottoman set will give you a smooth gliding motion that is easy and quiet.With this glider unlike others, you can change the cushion for washing. It has amazing stability, made of high-quality fabric and what makes it even greater is that it does not require any assembly. What’s more, this nursery glider is large enough to accommodate you and your baby. The only issue with this glider is that it is somehow heavier. Those who are not so strong will need a helping hand in changing the position of this glider in the house. Measures 41 inches high×27 inches wide×28 inches deep. The ottoman measures 14.5’’ high×20’’ wide×15.5’’ deep. 90% Pre-assembled by the manufacturer. Cushions with thick foam filling. This glider has super comfortable cushions that are fluffy and with thickened foam filling that will give you comfort as you hold your little one. The padded arm chair will give you the extra support when your hands tire. The four innerspring will give you and your little one enough support as well as slow and smooth gliding motion. The amazing beauty of this modern glider will catch the attention of your guests. You will not require any kind of assembling as it is already assembled by the manufacturer. All you will need is you and your baby to rock on it. It is made of durable fabrics.It is also very stable. It is a little bit heavier. You might require an extra hand while changing its position in the living room. Costzon Baby Glider & Ottoman Cushion set (Beige) will be a lovely companion for you and your baby. It will make your feeding time your child’s play time. It will match and add the charm of beauty to your house. It is heavily padded; you will not feel tired in any way until your little one is deep asleep. The padded arm chairs will give your baby support as the glider rocks your baby to sleep. What’s more, it is possible to place your feet on the ottoman and rock it at the same time. This masterpiece is made of wood which gives it that traditional beauty and adds to its sturdiness. 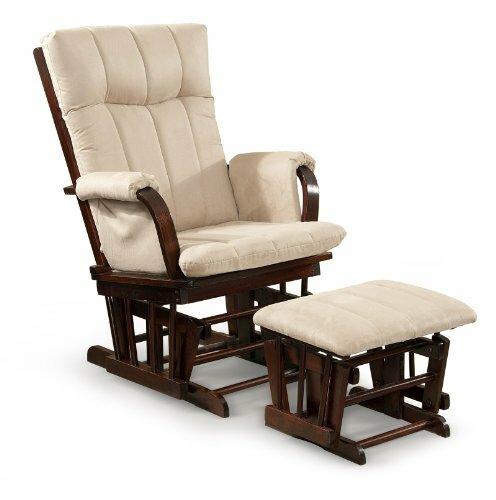 You will love the comfort on this glider. Made of microfiber fabric and solid beech wood. Has a removable cushion for the chair. Metallic enclosed ball bearings for gliding. The solid beech wood is high quality, heavy duty and abrasion resistant. It will rock you and your little one for ages. The removable cushion will give you room for washing or replacing it with another. There is a side pocket for you to place your magazines, books, newspapers or even your TV remote. The metal enclosed ball bearings offer a smooth and quiet gliding motion that will be great for lulling your little one to sleep. You will enjoy placing your feet on the padded ottoman. This will give you extra comfort while you watch and sing for your little one to sleep. The back of the chair cannot be adjusted, and the back of the seat and the ottoman are only handing washable. This glider will provide ultimate comfort for you and your baby. It has soft microfiber fabric and thick padded seats and ottoman cushions. Not forgetting the padded arm so that you can you’re your hands on them while singing for your baby to sleep. This glider’s smooth gliding motion will not only see that your baby falls asleep, but it will also give you a nice therapy that will ease your stress levels. The adjustable seat and the ottoman will give you a perfect sitting position. 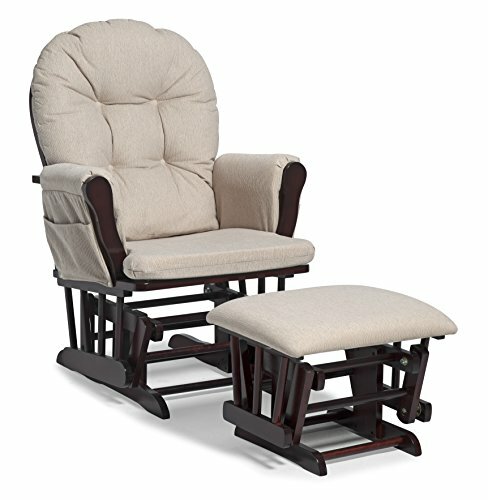 If you are one of those proud parents who have been looking forward to buying the best nursery glider for you baby, this is it. This nursery glider will make it very easy for your baby to fall asleep. The only issue to be worried about when buying this glider is that it lacks removable cushion covers. Made of soft microfiber fabric. Padded and tufted seat back. Padded seat and ottoman cushions. This glider has an adjustable seat that will ensure you sit in the right position to hold your baby comfortably. The padded seat cushions and the arms will give you that extra comfort. The smooth gliding motion will get your baby to sleep within no time and give an extra credit therapy that will ease stress levels. The ottoman has a perfect height that will give you the right angle to give your baby that love and a mommy gesture. The padded and tufted seat back adds extra beauty and strength to the glider. This will just suit your living room. It has no removable cushion covers for changing and washing. With Stork Craft ﻿Hoop glider, you will have a bliss while feeding your little one. This incredible glider has amazing features that will make it stand out from the others. From the metallic ball bearings that will give you and your baby a smooth gliding motion, to the thickly padded cushions and arms. You will have maximum comfort while you sing for your baby to sleep. On the sides, it has a convenient storage pocket for you to put your lovely magazines, books and other documents you might want to read while lulling your baby to sleep. The pockets are even big enough to hold toys and other baby gears. This glider will match exactly with your home décor. You will not have to isolate it or put it in a dark room. What’s more, this nursery glider meets the Canadian and US standards. With the cleanable cushions, cleaning this nursery is just a walk in the park. Spot cleanable back and seat cushions. Meets U.S and Canadian standards. Assembled dimensions are 24.75’’ length×25.75’’ width× 39.5’’ High while the Ottoman is 20.5’’ length× 16’’ width× 14.5 high. It has convenient storage pocket for storing magazine, TV remote, toys or other baby lulling gear. The ottoman will provide the extra comfort while you sing your baby to sleep. This glider is beautiful it will fit your home’s décor. The seat back and the cushions are spot cleanable making the clean and fresh across the year. The metallic ball bearings will give your little one smooth and quite rocking or gliding motion. Your baby will sleep without even realizing it. The heavily padded seats cushion and the arm will give you comfort as you nurse and rock your baby to sleep. The wooden materials are not strong enough to hold the weight of up to 140 pounds. 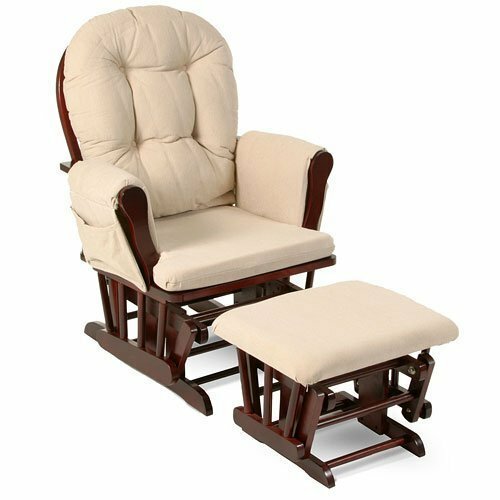 5.﻿﻿Beige Bowback Baby Glider Rocker Chair with Ottoman. The solid wood work done on this glider is of a high quality. This glider is strong, soft and cozy. It will be suitable for your nursery and even bedroom. This is a daddy and mommy kind of a glider. It will match with most of your home décor. The beige cushions and the rich finish is beautiful and stylish. The polyester padding is soft and will offer a great comfort to you and your baby. The enclosed metal bearings will offer you and your baby smooth and quiet gliding motion. This product has a non-toxic finish which makes it very safe for your baby. What’s more, this glider is very sturdy because of its wooden structure. It is also very safe and healthy because it is made using a polyester padding. It also has a non-removable cushion making it hard to clean it. This is the only issue to be worried about when buying this product. The beige cushions will offer great comfort to you and your baby. The soft, thick polyester padding are cozy and give you a luxurious feeling while you sing your little one to sleep. The wooden structure will make this glider sturdy. You and your baby’s safety are guaranteed on it. The metallic ball bearings will give extremely smooth gliding motion that will lull your little into sleep within no time. The polyester paddings are safe and healthy. They are completely hypoallergenic. The cushion covers are not removable making them hard to clean. We believe that you can now make an informed decision when buying the best nursery glider for your baby. All the information you need is available, and it is now upon you to put into practice what you have learned from this article. 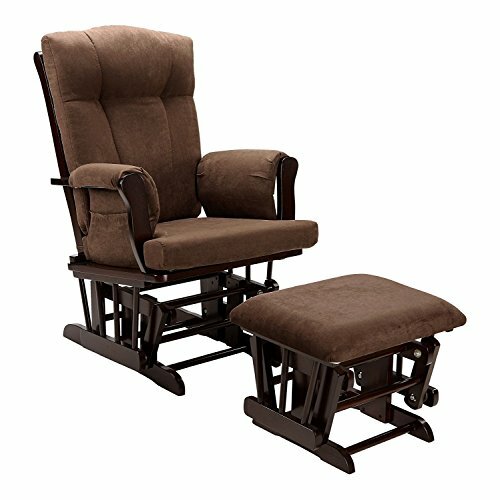 After reviewing the top five best nursery gliders, you will agree with us that Artiva USA Home Deluxe Microfiber Cushion Wood glider Rocker Chair and ottoman set (Mocha) is the best nursery glider you will ever get on the market. It has the features that will help you feed and lull your baby to sleep. It swivels and can recline to different positions. This glider will suit your home furniture. You will not need to drag it in out of your living room. The fabric is washable and durable. We added the other 4 nursery gliders you would love. All the best as you buy one for your baby. This is the extended part of the glider that will support your head while you sing for your baby to sleep. This will give you comfort as you rock the glider. It will also give you a nice control over the glider. Without a high back, you will easily get worn out, bearing in mind that some babies take ages to fall asleep. The arm rest will give you a good chance to rest your hands on them. Don’t take the weight of your little one for granted. As long as you are not a body builder, your hands and elbows will get tired carrying your baby. A nice cushioned or padded arm rest will give you comfort while you sing for your little one to sleep. Ottoman is a set that will come with the glider for you to rest your legs on while you rock your baby to sleep. Some gliders don’t come with this set. A good glider should come with an ottoman. It is all about your comfort. Without your comfort, your baby will not also experience that motherly love that will draw her into sleep. Ottoman should be padded and at a reasonable height to give you a good position to sing and read some books for your baby to sleep. Sometimes when soothing your little one to sleep, you might want to read or control the volume of the TV. The TV might be louder, and it might not be giving your little one a humble time to sleep. You will need to access the remote control so fast and without disturbing your little one. The storage pocket will get you organized and help you get the necessary things you will need close to you while nursing your little one. The pockets will also hold the reading materials, magazines, newspapers and even toys. Sitting down involve muscles and joints. At some position, these joints and muscles may not offer enough support to your body parts. And with extra weight on you, things will be harder for the joints and muscles. You will need external support. A glider with a lumber support will give your back enough support while you soothe your baby. You may not require a pillow to support your back. This is a must have safety feature. The locking mechanism will help you get out of the glider without disturbing your little one. You will also need this feature when your baby starts crawling. At a locked position your baby’s fingers and toes will be safe, they will not get trapped by the glider. As you baby grows and reaches the toddler stage, she will have the curiosity and urge to climb on everything. You will need to lock the glider to keep your baby safe from falling. Choosing between the two is very confusing at times. These two baby gears have one mission, to lull your baby to sleep. They, however, operate on different principles. This is a chair that will give you and your little one a sensational movement. The glider has a pivoted mechanism that will rock you and your baby back and forward. They are advantageous because they fit your homes décor, most of them come with ottoman, are well cushioned and take a little amount of space. A nursery rocker provides gentle and smooth soothing motion for your baby. Unlike gliders, they move in an arc like motion. Your baby will receive a floating sensation. They can also use batteries or power plugs to trigger the sensational movement. Nursery Rockers move in so many directions. Forward and backward, sideways or you can combine both to create a circular kind of movement.